Halloween is almost here, a fun time for kids of all ages but it can be a little frightful for your four-legged furbaby. Frequent ringing on the door bell, large and loud decorations, chocolate candy within nose-reach and much more. Fear not. We have tips for how to work with your dog through each of these scary situations. If you live in a neighborhood where little ghosts or goblins ring on the door on Halloween, this evening can be extremely stressful for your dog. For most dogs, costumes are a trigger. Trick-or-treaters don’t look like “normal” people which can make dogs frightened, they may even bolt off or bite out of fear. To minimize stress, we recommend keeping your dog in a kennel out of sight of the front door or confining your dog to a closed room for the evening with a bowl of water and dog toys to stay occupied. You can also play music or turn on the TV loud enough to drown out sounds to keep your dog comfortable. It can also be a good idea for your dog to wear a collar with an ID tag, just in case he manage to sneak out the door. There are more and more large Halloween decorations around, with unexpected movements and sounds to give kids a little scare. Your dog may react to these as well! 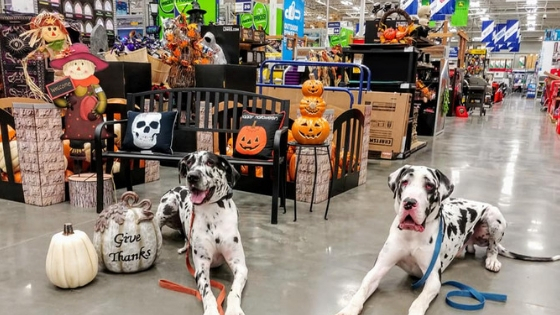 If you have motion-activated decor or large frightful displays set up inside or outside your house it can be a good idea to calmly introduce your dog to these new additions. In daylight, let your dog sniff around the decorations without sound or movement, and reward calm exploration. Practicing with a few commands such as sit or place next to the decor. When your dog is ready for it, turn on sounds or movement and continue with more obedience work among your ghoolish distractions. Finally, practice in the evening so your dog will get used to how they move in the dark when they will be going off. Here at Offleash K9 Training Colorado, we often use these highly distracting decorations as a way to practice advanced obedience work with dogs. 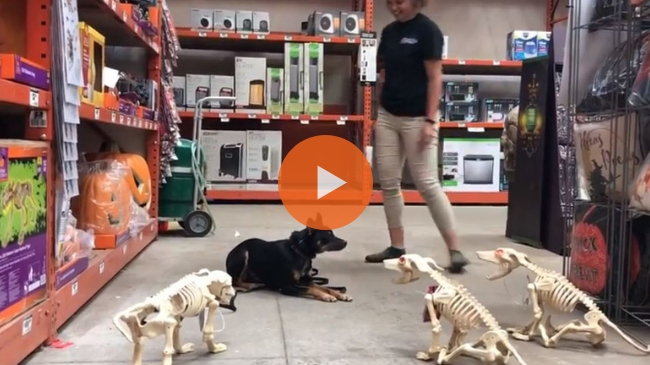 Take a look at Billy practicing down among barking skeleton dogs. Pet stores and Halloween stores alike carry many costumes for our dogs. While they may look adorable dressed up as a hot dog, pirate or a Star Wars character, be aware that your dog may not appreciate the costume as much as you do. We do not recommend putting a costume on your dog if they do not like it. Look for signs of discomfort: low body posture, shrugging, scratching, or big “fish-eyes”, are just some ways your dog use to tell you to take their costume off. Be respectful to your doggy and immediately remove the costume to avoid unnecessary stress and anxiety. It is also worth remembering that if you yourself dress up, your new disguise can scare your dog and create a negative reaction. All dogs are different, some don’t mind, others may have an adverse reaction. In costume, you look different to your dog so please be calm and cautious. Are you carving Jack-o-lanterns and placing them by your door this year? Remember to keep those wagging tails and sniffing noses a safe distance from these decorations. Raw pumpkin is not good for your dog to eat and of course, never let your dog get close to a pumpkin that has a real burning candle within it. While raw pumpkin is not good for your dog to eat, did you know that a little canned pumpkin can actually be a healthy treat alternative? Filled with fiber and beta-carotene, it can even be good for both diarrhea and constipation. But stay away from the sugary pie-filling canned version! If you enjoy baking, here is an easy pumpkin-based dog treat recipe from Allrecipes.com that you can try at home. A perfect positive reward to give your pooch when showing good manners throughout Halloween. You probably already know that chocolate is toxic to dogs. VCA Hospitals report that “while rarely fatal, chocolate ingestion can result in significant illness”. (source: https://vcahospitals.com/know-your-pet/chocolate-poisoning-in-dogs) Vomiting, diarrhea, increased thirst, excess urination and increased heart rate are some of the signs of chocolate poisoning. If you believe your dog has munched on chocolate, it is always best to contact your veterinarian. Removing easy access to chocolates and other sweets the easiest way to avoid accidental chocolate poisoning. However, simply pushing the bowl of candy deeper in on the counter may not be enough. Dogs can be very innovative when it comes to counter-surfing to snag a treat. Instead, place any candy on surfaces high up that you too have to reach to get. Also make sure to keep pantry doors properly closed. Halloween is a fun time for kids of all ages. We hope these tips help it make a spooktactular time for your dog too!